Erica Bunker | DIY Style! The Art of Cultivating a Stylish Wardrobe: I'm having Marsala with splash of Sequin for New Year's Eve! I'm having Marsala with splash of Sequin for New Year's Eve! Well, it's the end of another year! And what a year it's been for me. I won't bore you with gory details, but let's just say I'm not sad to see it end. #ByeFelicia But as usual, I've had my love of fashion and sewing to keep my sanity intact. For the last couple of years, I've been up to my head in tailoring. I'm usually immersed in an end-of-the-year coat making project. Well, I finished up early this year. Go me! And I needed a simple, palate-cleansing project. McCall's 6991 had been in my to-sew pile and I'd also picked up this synthetic habotai a while ago. I liked the color. And just so happens that it's "Marsala", the color of 2015. Now, normally I would simply refer to this color as maroon. Isn't that what we've been calling it for years? But of course, heading into 2015, we're brand new! Semantics aside, it's a beautiful color that's flattering to most skintones and has always been a fall/winter staple with its rich wine-like deep red color. The size 14 sewed straight from the envelope. The fabric is pretty transparent, so the best seam finishing was French seams and narrow hems. This is a pretty straight forward design. 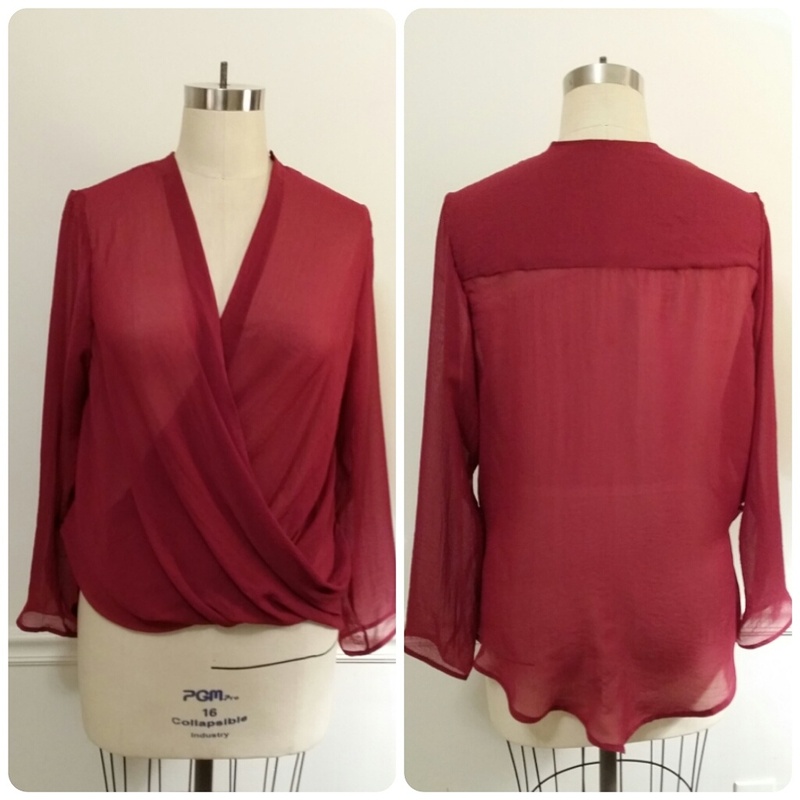 It's a very trendy top with it's wrap/twist front style and mullet or high low hemline. I've been seeing these tops everywhere from this length to the exaggerated back hemlines that drape to the back of the legs. I thought this would be a fun top to add to my wardrobe that I could wear a couple of times with minimal investment. Hence the reason I chose to make this in a synthetic. I know that the high low hemline is a style that you either love or hate. I think I've moved on from the dresses and skirts. But this particular blouse design just appealed to me. I think it'll work great with my leather leggings (which I really want to make another pair. Those are coming soon) and a pair of skinny jeans and tall boots. For an evening look, it pairs perfectly with my Vogue 8909 sequin joggers. Can I just tell y'all that I've truly gotten my money's worth out of these pants. I've loved these pants -- nearly to death! I'm going to buy more sequin to make another pair of black ones and a maybe a pair of gold ones. Not necessarily a jogger style. But probably with a tapered leg. I think they're a great wardrobe staple. Well, they are in mine! They fit perfectly into my lifestyle. I've found that they just "work" when you need to be less than cocktail, but more than casual. If that makes any sense. I tend to find myself in a lot of those fashionable predicaments. Wishing you all a fabulous sewing New Year! Happy new year to you Erica! Your blog has been a great read, varied garments showing a lot of sewing skills so I've found it a cross between a fashion blog and a craft blog. I'm Impressed with your productivity- what have I been doing with my time? My garments are few and far between! Look forward to seeing what you come up with in 2015. Miss J, I'm so glad you get it! It has always been the foundation of my blog to straddle the line between sewing and fashion blogger. Thanks so much for reading. Happy new year! I love your new top - it looks much better than the one on the pattern jacket. Whatever the gory details, you sure don't look worse for the wear! Thanks for always holding your head high and looking beautiful at the same time dear friend in my head. Happy New Year! Thank you so much Sheri!!! I am always thrilled to see your newest creations. I am now convinced I should try this top pattern. I am going on a pattern diet for 2015, so I can get this today! Happy New Year! What a fabulous outfit! Happy New Year! Happy New Year Erica! I've enjoyed watching your makes this year and your tremendous dedication to working out on IG. Even though it sounds like it's been a challenging year, it appears that you got the best of it in the end. I love those sequins pants! I ended up buying that pattern because of your red version and it's in my queue for this winter. Hopefully I'll find the right fabric soon! Anyway, I'm looking forward to following you in 2015 as it's sure to be stylish and inspiring. Thanks so much Grace for always being a dedicated and supportive reader! I didn't know that I needed sequin joggers in my life until right now! :) Happy New Year to you and yours! You'd be surprised how easily they would pair with a cute sneaker like a black New Balance or Nike jogger. Or a Van style slip on. They are more versatile and practical than one might think. Thanks Ginger! Fabulous! A blessed New Year and continue to inspire as you do! Happy New Year Erica, Gosh I wish I had an occasion to wear sequin pants they look great as does the outfit Love the colour of that top. Happy sewing for 2015. See my reply to Ginger! Thanks Louise! Hadn't seen the joggers, I just might have to put these on my list too for 2015. They're wonderfully glamorous and casual at the same time. Indeed they are! Thanks Mary Beth! It is a great look on you and you look wonderful.......smaller..... Wish you the best. I would hope so as much as I'm in that gym! Thanks Body Design! Love your year end outfit. I bought a pair of sequin joggers earlier this month for one of those just in case moments that may arise. Have a Happy New Year! I hope you enjoy yours as much as I have mine! Thanks Lucy! You're looking really great, Erica! All of your hard work is really paying off - not just in the shape of your body, but you really are glowing! Keep it up! Thanks for noticing Nancy! I'm REALLY in a great place! Girl, you are beautiful!!! Happy New Year Erica!!!! Bpatricia74, you are beyond sweet! Thank you! Another stunner! 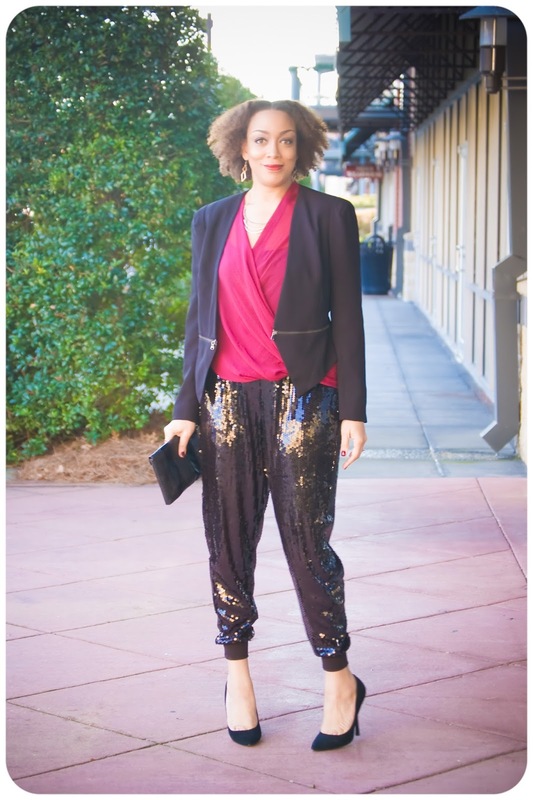 Love, love, love the sequin pants and the whole outfit! Happy New Year and looking forward to seeing more of your creations in 2015! Happy New Year! And, thanks for all the great posts of beautiful garments. 2015! You look fabulous . Those pants are amazing and the top is just gorgeous. I love your style and styling. All that time at the gym has paid off you look sensational. all the best for the New Year. despite your 2014 challenges, you ended up looking 20 years younger and absolutely fabulous. the clothes are great, too. very best to you and yours. Twenty years? Wow! LOL. Thanks so much June! Happy New Year! I love the sequin joggers!! I have this pattern and I have been looking for the right fabric. I have looked at some sequin fabric at Joann's, but it seemed really lightweight. Is there any fabric online you might suggest that would be a good weight for a project like this? Thanks!! I can't really call it. Sometimes you really have to swatch. Thanks Marla! Erica, this top rocks. So does your black and white one, but I really like the red. May I ask you how you finished the hem on the bottom and cuffs? It is SO neat and so evenly done. Little finishes like this make a garment really look professional. Another Version of Vogue 8939 | Shades of Grey!